That event opened-up my mind to personal finance. But I was still jobless at that time. I am freshly out of school and just passed the board exam. Soon, my attention was shifted to finding a job and being good in my chosen profession, a mechanical engineer. 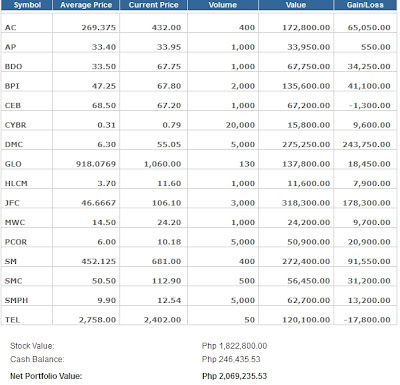 In mid-2009, in the middle of the unprecedented recession, I discovered PSE's stock trading game. It was a fantasy game wherein you will be given an imaginary amount of money, 1 Million pesos, as a start-up capital. Your mission is to invest that into existing stocks in the Philippine Stock Exchange (PSE). The PSE Stock Trading Game mimics the actual stock trading procedure. The rates at which stocks are sold reflects the real-world values. The board lot as well as the time of trading is also the same as the real one. In short, I joined the game. I bought stocks randomly. Only those companies whom I know like SM, GMA7, Jollibee, DMCI, Globe Telecoms, BPI etc. I kept on trading for over two months and because of the small progress and losses due to recession, I lost my interest. Eventually, I left the game. 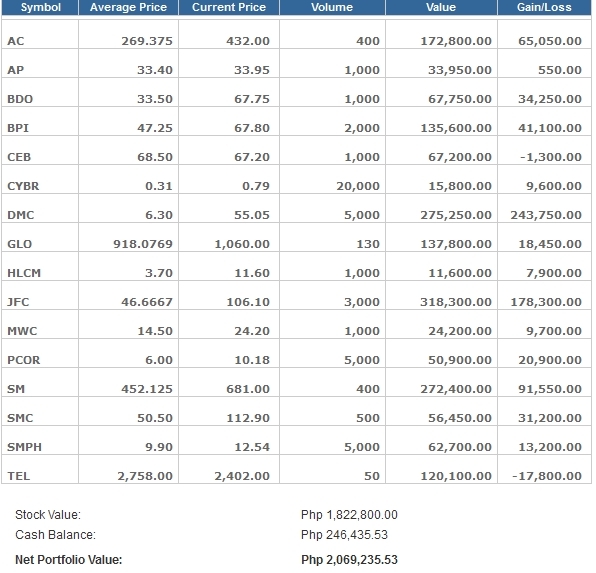 Then comes 2012, after almost three years of inactivity, I visited PSE Stock Trading Game just to see how much did I virtually earn from my stock picks. The result were surprising (or is it?). I was shocked to find out that my 1Million virtual money is now worth 2 Million. 100% growth in three years? Imagine if I invested real money on it. From that moment on, my interest in personal finance and investments was rekindled. I love the Colayco Foundation's articles in Lenddo Philippines.